Given the vast literature on the Indochina wars, whether the French colonial conflict of 1945 to 1954 or the US war with North Vietnam of 1954 to 1975, it might be asked why the need for another study of a familiar subject. The value of this new, magisterial account, which has justly received plaudits from scholars, former military commanders and policymakers, is how comprehensive it is. The British historian Max Hastings has deployed his considerable skills as a former journalist, military historian and biographer to provide a narrative history that vividly presents the tragedy of Vietnam across multiple dimensions — combining social, political, military and diplomatic history to document the full complexity of the war with an immediacy and clarity that manages to be unsentimental and critical, but also deeply affecting. As a correspondent who has reported from both the United States and Vietnam, Hastings combines his personal experiences with an exhaustive reading of the secondary literature in English. Although the account intentionally does not rely on primary documentary sources to explore the political dimension of the conflict, it does draw on large numbers of interviews with Americans and Vietnamese and valuably incorporates findings from thousands of pages of translated Vietnamese documents and histories. As a consequence, the book not only details the familiar high politics of the different elite actors — politicians and military officials — on all sides of the conflict, it also memorably and with visceral intensity depicts the experiences of ordinary citizens — again, from all sides of the conflict — caught up in the tragedy, providing a grassroots perspective that frequently has the immediacy of a novel or a personal memoir. Hastings’ account avoids simplistic judgments about the rights and wrongs of the conflict, but at the same time does not hesitate to apportion blame. The tragedy of the conflict reflects the flawed motivations of multiple actors on all sides. This includes the French colonial administrators and 4th Republic politicians who sought to reimpose their imperial dominion over Indochina in the aftermath of the Second World War with scant regard for the interests of their economically impoverished Vietnamese subjects, while installing an effete Bao Dai as puppet emperor of the new post-war colony. No attempt was made by Paris to cultivate a local political leadership that could have plausibly represented the indigenous population; nor was there any credible effort by the French to develop a mutual partnership with local actors that could help guard against the emerging nationalist challenge that coalesced around Ho Chi Minh and the Vietminh from 1941. Arrogance and overconfidence on the part of France ultimately culminated in the French tragedy at Dien Bien Phu in 1954, the climactic defeat of the French military at the hands of the North Vietnamese commanded by the brilliant strategist, General Vo Nguyen Giap. Hastings’ dramatic and vivid retelling of the protracted siege in the highlands of north Vietnam captures the brutality of the engagement and the hubris of French commanders, such as Henri Navarre and Rene Cogny, who were motivated as much by their desire to erase the painful memories of defeat in the Second World War as they were by any misguided imperial commitment to maintain the post-war colonial regime. The failure of external powers to take seriously the interests and aspirations of local actors is a theme that runs consistently throughout the narrative. For the US, this was especially true at the highest levels of government. While US liberal exceptionalism may have shaped the early views of President Franklin Roosevelt in his opposition to any reintroduction of European colonialism in Southeast Asia, this was soon eclipsed by Cold War priorities and the need to stand firm against the threat of Communism globally and in Southeast Asia. President Harry Truman’s prioritization of Western Europe encouraged Washington to side with the former colonial powers against the interests of local nationalists. Similarly, by the early 1950s, when Dwight Eisenhower had assumed the presidency, the negative legacy of the Korean War, the desire to avoid repeating the errors of appeasement from the 1930s and the need to prevent the collapse of communist “dominoes” in Asia, encouraged the Americans to bolster local elites with economic aid and political support, but with little, if any, concern for the genuine needs and aspirations of the Vietnamese people. US failings reflected a strategic myopia that misread the nationalist contest between Ho Chi Minh’s North Vietnam and South Vietnam under the leadership of Ngo Dinh Diem (Bao Dai’s successor) as a simple proxy for the wider struggle between the Free World and international Communism. 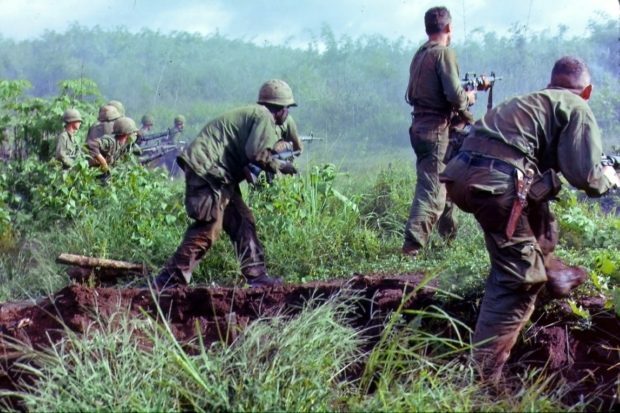 The reality was more complex — a situation in which North Vietnam’s Communist allies, China and the Soviet Union, were, in Hastings’ view, reluctant to put all their weight behind its efforts to conquer the South out of fear that this would lead to an escalation and expansion of the conflict with the US that would conflict with Beijing’s and Moscow’s competing domestic and geopolitical priorities. This misreading of a local struggle as an indication of a larger international conflict drew the US into a brutally debilitating regional war with devastating humanitarian consequences for all sides for more than 20 years. US presidents — Truman, Eisenhower, John F. Kennedy, Lyndon Johnson and Richard Nixon — all acted with scant regard to the wishes of their South Vietnamese allies, and all too often, most notably under Kennedy and Johnson, directly or indirectly supported domestic coups that destabilized and replaced local leaders who had questionable legitimacy in the eyes of their own people. A combination of profound US ignorance of Vietnamese history and culture and arrogant over-confidence in a US modernization agenda that prioritized material strength and economic development over the promotion of social cohesion and indigenous spiritual and moral legitimacy undercut national identity formation within South Vietnam. Even when the Americans focused on the narrow agenda of bolstering the military capacity of the South, US military officials were stymied by the poor morale of the local forces, as well as the structural problems faced by US troops (especially from the late 1960s onwards), such as corruption, racial tensions and declining morale, exacerbated by widespread drug use and a more confident and resilient enemy. While US military leadership was ill-informed, under-resourced and ill-equipped to address broader social challenges, the more fundamental failing was at the top of the US political system. Leaders such as Kennedy and Johnson were too inclined to accept the over-confident assessments of senior officials, such as Defense Secretary Robert McNamara, who were all too often blinded by self-belief, or who wilfully disregarded or manipulated the truth to support their ideological agendas. While there were better informed and sympathetic US officials (for example, within the State Department and the United States Information Agency) with a more immediate connection with Vietnam, all too often their views were eclipsed by the thinking of more partisan officials back in Washington. Hasting introduces us to a large cast of characters — Americans and Vietnamese who had an empathetic and nuanced understanding of the challenge of nation-building, but whose views were secondary to the more immediate national interests of the US. American domestic interests all too often took precedence over South Vietnamese concerns. Under Johnson, the welfare priorities of his Great Society program competed with strategic objectives in Southeast Asia and the president believed, incorrectly, that an incremental commitment of US forces, rather than a massive and immediate deployment of US strength, would be sufficient to defeat the enemy. For Nixon and his National Security Adviser Henry Kissinger, winning elections at home or the geopolitical game of engaging with China as a means of challenging the Soviet Union were far more important than prioritizing the interests of America’s South Vietnamese ally. Expanding the war into Cambodia (an action that tragically led to the rise of the genocidal Khmer Rouge), or opportunistic bombing campaigns against the North (such as Operation Linebacker in 1972), were cynical efforts to promote Nixon’s re-election interests, rather than a principled defense of US and South Vietnamese strategic goals. Moral shortcomings were not confined to the US or its South Vietnamese ally in Hanoi. North Vietnam’s brutal authoritarianism matched, and in some cases, exceeded that of the South. Ho Chi Minh and his successor Le Duan ruled ruthlessly. Together with both the Vietminh during the French colonial period and the Viet Cong from the late 1950s onwards, Hanoi’s leaders used fear, brutality and torture to control their opponents on both sides of the 17th parallel that divided the country after 1954. Unlike the leadership in South Vietnam, the North could rely on propaganda and a tighter control over information to foster an overly romanticized and valorized narrative of national resistance that was all too often embraced uncritically by Western journalists too ready to frame the Indochina wars as a Manichean struggle between the forces of good and evil. Such simplistic narratives were bolstered by the moral appeal of North Vietnam. Ho Chi Minh had a genuine charisma that his South Vietnamese counterparts lacked. Diem, for example, was not only corrupt, but also arrogant and intensely factional, favoring the interests of South Vietnam’s Catholic elites while persecuting the Buddhist majority. However much the national liberation idealism of North Vietnam appealed to student radicals and some progressives in the US, especially after 1968, Hanoi’s leaders, including Ho, remained (at least according to Hastings) committed communists and wedded to a form of Stalinist authoritarianism that brooked no opposition, both during the conflict and after 1975 when the North finally overran the South. The tragedy of Vietnam that emerges from Hastings’ poignant and sobering account is not merely the huge costs in lives on all sides of the conflict, but the profound gap between the rhetorical aspirations and day-to-day reality of the various actors involved in the conflict. At all levels of society — both among national leaders and the ordinary, day-to-day protagonists (soldiers, civilians, journalists, spooks, and technocrats) — self-delusion and ignorance all too often encouraged actions that had devasting consequences for tens if not hundreds of thousands of individuals. Of the many lessons to be drawn from this experience, one stands out: the need to guard against hubris and overconfidence and the importance of humility in waging war.